For the hotel awards, see César Award (hotels). 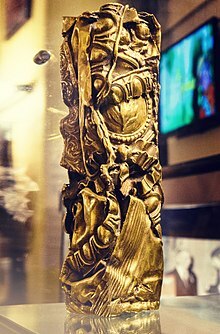 The César Award is considered the highest film honor in France, the French film industry's equivalent to the Molière Award for theatre, and the Victoires de la Musique for music. In cinema, it is the French equivalent to the Academy Award. The award was created by Georges Cravenne, who was also the creator of the Molière Award for theatre. The name of the award comes from the sculptor César Baldaccini (1921–1998) who created it. The 44th César Awards ceremony took place on 22 February 2019. Custody (2017 film), directed by Xavier Legrand, won the award for Best Film. In 1974, Georges Cravenne founded the Academy of Arts and Techniques of Cinema that was, from the outset, intended to reward the achievements and the most remarkable film artwork, to have a French equivalent to the American Oscars. The first César Awards – also known as the "Night of Caesar" – were held on 3 April 1976 under the chairmanship of Jean Gabin who watched the ceremony from the front row seated in a wheelchair a few months before his death. The name of the award comes from the sculptor César, designer of the trophy awarded to the winners in each category. It is also an homage to the Raimu, the great French actor and performer of Marseille trilogy of Marcel Pagnol, in which Raimu played the character of César. The César Awards replaced the Étoile de cristal [fr], which was awarded from 1955 to 1975. Other prizes had been awarded to French cinema in the past. From 1934 to 1986, the Grand prix du cinéma français [fr], established by film pioneer Louis Lumière, was given to one film a year. In the 1950s, the Victoire du cinéma français [fr] was awarded each June. Lacking popular enthusiasm compared to the Étoile de cristal, this award was discontinued after 1964. To aid voters, the Académie identifies each year films released in France and provides a guide to the works and eligible professionals. A DVD set of French or primarily French productions produced during the year is sent in December with the catalog of films to the electors. After the nominations are revealed, at the end of January, special screenings of the nominated films are shown at the Le Balzac cinema in Paris, near the Champs-Élysées. Each year, a special lunch (Déjeuner des nommés aux César du cinéma [fr]) for nominees is held at the famous Fouquet's restaurant on the Champs-Élysées, a few weeks before the ceremony. ^ "Dates, les lieux et les diffuseurs" (PDF). Académie des César. Retrieved 17 March 2015. ^ "Présidences de Cérémonie" (PDF). Académie des César. Retrieved 17 March 2015. ^ "Maîtres de Cérémonie" (PDF). Académie des César. Retrieved 17 March 2015. Wikimedia Commons has media related to César Awards. This page was last edited on 20 April 2019, at 06:09 (UTC).